The game, The Great Giana Sisters was steeped in controversy and Nintendo believed it to be a "knock-off" of their Mario Bros franchise in an earlier era of gaming. Fortunately, things have changed and the Giana Sisters have returned on the Nintendo DS that promises gamers a truly addictive, colourful and entertaining gaming experience in this classic platforming title. The story of course revolves around a girl called Giana who falls asleep and enters a mysterious dream world and must find a magical diamond in order for her to return. Filled with action, strangeness and colourful characters, this is the perfect formula for arcade goodness! 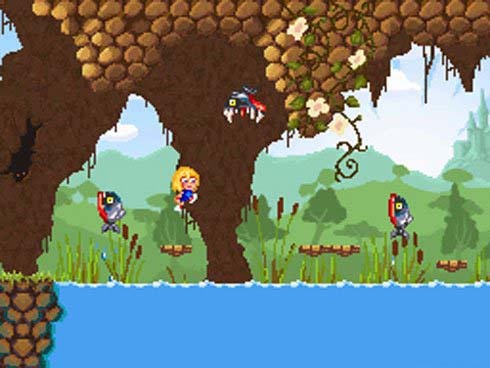 The mechanics behind the Giana Sisters is quite simple, you run, jump and battle your way through a variety of different environments in order to complete the title. The main controls are the buttons on the DS that navigate our female heroine that works quite well. The Stylus is also used in particular areas of the game such as finding Cola which can be used to put out flames in order to progress or to use bubble gum. 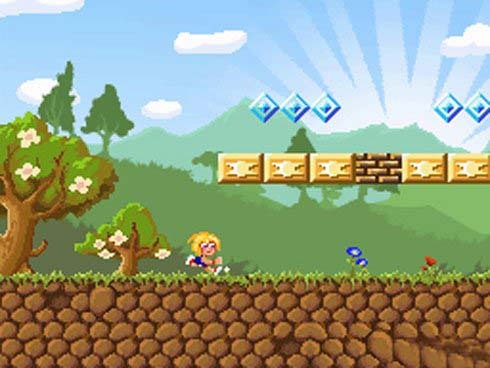 As you run, jump on the heads of enemies and find diamonds which are littered through the gaming environment, the twist to this game is Punk Giana, your "sister". As with Mario, the normal Giana Sister is a little sweet thing who at times is quite powerless and in order to defeat certain bosses and reach other areas in the game, you need to transform into Punk Giana. This is done by finding a ball in the game which is generally hidden somewhere and when you run over it, you are transformed into another character who is more powerful and has the ability to shoot fireballs. Needless to say, it's classic arcade fun. The gaming environments are brilliant designed and are quite diverse as you explore these strange worlds and of course take on some Dragon-like bosses. There are quite a few puzzles in the game that did have us stumped at times but it's all part of the experience. Although the stylus can be used to select items to use in the game, the developers have even used the microphone in the game and by blowing on it will keep your character in the air when combined with bubble gum. Pretty damn cool if you ask me. The musical score of the Giana Sisters is brilliant and is quite boppy and sounds like a Saturday Morning Cartoon series which suits perfectly. The reason why the soundtrack is so cool is because it's a remix by Fabian del Priore of the original soundtrack written by game composer Chris Hulsbeck. Although the sound effects are a little lame in the game, the graphics are quite impressive for a non-Nintendo developer with colourful environments and some great attention to detail. Quite professional. At the end of the day, the Giana Sisters may be a Mario Bros clone but it has enough differences to stand on its own merits that we strongly believe. 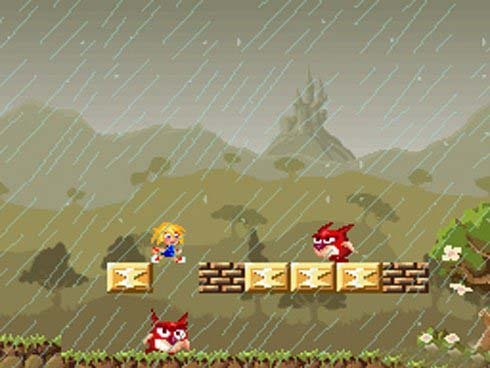 Although no multiplayer modes, the game does have one very big bonus to players who have completed the game and if you manage to finish the game without losing any lives, it unlocks the original game, The Great Giana Sisters to play. And yes, this was way too difficult for us to do but we had fun trying though. Definitely a game recommended to lovers or classic arcade fun!